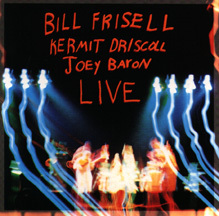 Another excellent album by the Bill Frisell Band with Kermit Driscoll and Joey Baron, Live encounters the band fooling around on Frisell's simple melodies. This album is a little more out than a lot of current fans of Frisell might be used to, but for those with a taste for noise and a love of improvisation, this album is incredible. It has a little more of a rock flavor than a lot of Frisell's other material, with Frisell wailing out some mean solos. This is the other side of the Bill Frisell Band which created the gorgeous Go West. The interesting idea of this album is that songs are often defined by melody and the number of bars in a chorus. Using those two factors as signposts, the band then proceeds to pull apart songs, improvising new rhythms, time signatures and sounds with a turn-on-a-dime precision. Must be heard to be believed. Of particular note is the incredible Joey Baron, who I think someone once called a Jedi rhythmast. That is one of the best descriptions I have ever heard of Baron's playing, which is supernaturally adaptive and appealing. Like the light sabre battles from the Star Wars movies, Joey Baron's playing has viscerally appealing quality that is complex and lyrical. This is a great album for anyone who likes the rock and noise edge of Frisell, and may especially appeal to fans of Naked City.